The Civil Administration's monitoring unit continued on Sunday to enforce measures against dangerous air pollution of in the village of Yabed in Area B, which lies within the Palestinian Authority's civil responsibility. For the first time today, the use of drones has led to the exposure of additional pruning centers used for the polluting charcoal production activity, and as a result, the implementation of additional enforcement efforts to confiscate the tree trunks, prevent pollution and eliminate the pollution problem. In the framework of the operation, about 200 wooden casks were seized and 23 sites were extinguished, in which the polluting charcoal workers operated. The Civil Administration carried out a large-scale operation in Yabed on April against the charcoal furnaces, stopping the pollution caused by the primitive methods used for charcoal production, which involve covering the wood with hay and earth, lighting it from a hole on the top of the pile and letting it burn slowly for 15 days at which point the hole is closed with earth until the wood turns into charcoal. Close to 70% of workers in the local industry, who do not wear protective masks, have respiratory issues, as do 25% of the area's children. The smoke fumes reach as far as Kfar Saba and cause respiratory problems for children there as well. 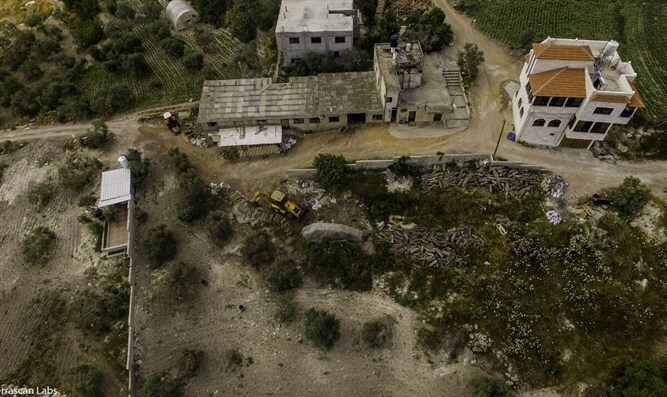 During the drone operations, it was found that the residents hid the tree trunks on the outskirts of the village near their homes in order to hide them from the intensive enforcement activity carried out by the Civil Administration's supervision unit against the activities of the polluters. The Coordinator of Government Activities in the Territories, Maj. Gen. Yoav Mordechai, wrote on the Facebook page in Arabic, "We are determined to act against the polluters in Yabed that harm the health of children in the area, especially among the residents of the region - Israelis and Palestinians alike." "The Civil Administration will continue to look for solutions in cooperation with the Palestinians, but at the same time the operation against the carbonization will continue, including taking measures against their owners," he said.